Today’s first was a fun family outing to the newly opened Cici’s Pizza for dinner! Eleven of us took advantage of the Opening Special of $5 for the buffet. We weren’t the only ones excited about welcoming Cici’s back to Joplin….the line was out the door when we arrived. Cici’s Pizza was always a popular Joplin restaurant. They served up pasta, salad, soup and a variety of pizzas, buffet style, for a very reasonable price. You could find all your favorite pizzas there plus a few specialties like Buffalo Wing Pizza and several dessert pizzas. The cinnamon rolls not only looked and smelled good, they tasted delicious! Our Cici’s Pizza was one of the restaurants that was destroyed the day of the May 2011 tornado. And with the reopening taking place almost three years later, it has been a very long wait for them to come back! 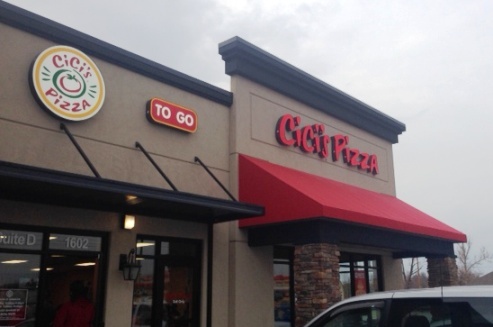 In fact, there was some concern that Cici’s would not return. Rumors alternated between saying the pizza place was not going to be in Joplin again to talk about its impending opening. It was only a couple of months ago, when I spotted the “Now Hiring” signs fluttering in front of its new location that I finally believed Cici’s was on the way back! We enjoyed our dinner, in spite of the crowd. The line moved quickly and the manager met each group as they paid and found tables to dine at. That was no small task for our large group, but he made it happen. Being on my detox diet, I chose to eat salad and a chicken soup with a clear broth. I didn’t feel deprived at all! I did walk down the buffet though, to see what was being offered. It was a great selection, although with the number of diners present, those pizzas didn’t last long! I saw a pizza I had never seen before….a macaroni & cheese pizza! My niece’s husband, Jon, declared it good. He said it tasted like macaroni & cheese on flatbread! I’m thrilled Cici’s has returned to Joplin. Each business, or restaurant, that reopens is a testament to the determination that has defined Joplin’s recovery. We can be knocked down, we can lose what is dear to us, but we cannot be kept down. What was lost can be rebuilt, when it is brick and mortar. We forever remember those dear souls who left us too soon. As we rise again, build again, move forward, their Spirit is interwoven with the Spirit of Hope that is Joplin.